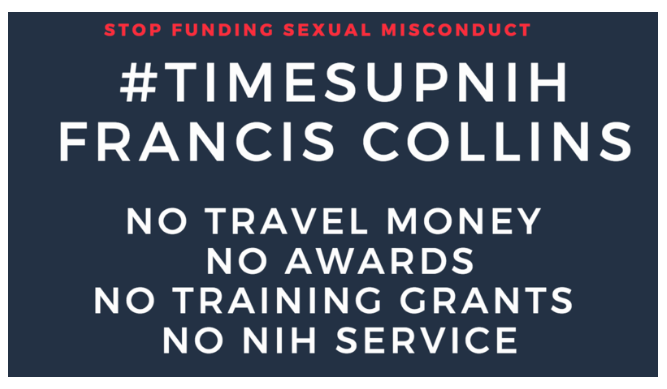 Sign the Change.org petition calling on Francis Collins to prohibit individuals guilty of sexual assault, harassment or retaliation from receiving government funds to train students and travel using government money. The petition also calls on barring individuals found guilty of working for study sections, counsels or other parts of the funding agency in which they can exert influence over distribution of funds to other investigators. What’s frustrating about the NIH’s lackadaisical approach to gender violence is that this topic has been on Collins’ agenda for at least two years. In 2016, he co-authored a letter to Nature indicating that the NIH was actively taking steps to address gender violence in science. Had he started working on this issue then, the NIH could have already proceeded with the lengthy rule-making process that he described recently. Scientists have had enough. BethAnn McLaughlin, Julie Libarkin, and Tisha Bohr started an online petition asking the NIH to stake a stand on gender violence. We agree that it needs to do this.